1 In the year that King Uzziah died, I saw the Lord seated on a throne, high and exalted, and the train of his robe filled the temple. 2 Above him were seraphs, each with six wings: With two wings they covered their faces, with two they covered their feet, and with two they were flying. 3 And they were calling to one another: “Holy, holy, holy is the LORD Almighty; the whole earth is full of his glory.” 4 At the sound of their voices the doorposts and thresholds shook and the temple was filled with smoke. In contrast to the mortality of King Uzziah, Isaiah now encounters the eternal Creator and King of the Universe and is confronted with God’s majesty. The text does not say, but I like to think he was worshipping in the earthly temple when he was caught up to the heavenly one. According to John 12:41 Isaiah actually saw Jesus in His glory before His incarnation (being born in Bethlehem of the Virgin Mary). The Apostle John also saw the Heavenly Throne Room, in Revelation 4 and 5. Both John and Isaiah describe a similar scene. The throne is high and elevated, illustrating that God’s position of authority is supreme, above all others. In his vision in Revelation, John describes an encircling rainbow, which is the symbol of the promise to Noah that God will never again send a flood to destroy all mankind. John had previously seen Christ in His glory when Jesus appeared to His disciples Peter, James and John on the Mount of Transfiguration: “And He was transfigured before them; and His face shone like the sun, and His garments became as white as light.” Matthew 17:2 The rainbow Isaiah saw may be created through a prism effect diffracting the light of God’s glory and bending it to the different wavelengths of rainbow colors. If an earthly rainbow is gorgeous, how much more this heavenly one, diffracting the blinding light of the Creator of the Universe. In addition to the throne, Isaiah saw God’s robe with a flowing train that filled the heavenly temple. 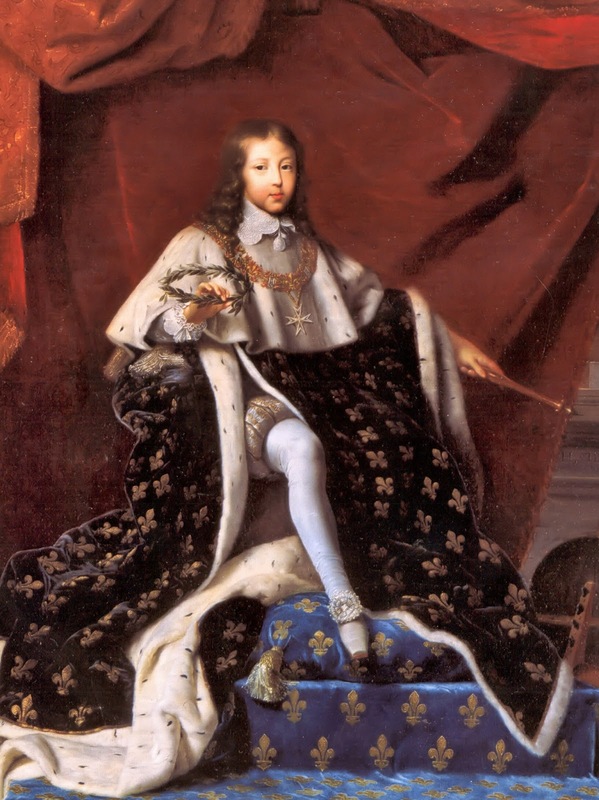 European kings often dressed in flashy coronation robes to display their power (For example, see the picture above of Louis XIV of France, known as the Sun King). The imagery in this passage is much grander. Next, Isaiah views the Seraphim. The Hebrew word seraph means “burning one” so perhaps they have a fiery appearance, presenting a fearsome aspect with their six wings. They are ‘standing’ before the Lord, meaning that they are in attendance as an honor guard. Eastern monarchs had many guards, attendants and ministers of state. A modern equivalent would be the President’s Secret Service and all his aides. These heavenly beings are praising God, saying “Holy, holy, holy is the LORD Almighty; the whole earth is full of his glory.” The repetition of ‘holy’ emphasizes their description. In their zeal and fervency, they call Him holy three times, the number of the perfect Trinity, and perhaps reflecting the Three Persons in One (Father, Son and Holy Spirit). The word ‘holy’ means ‘special, set apart, unique,’ and God is certainly all of that. He is the Lord Almighty, whose power created the Universe. He is the Lord of Hosts, the ruler of the heavenly assembly and the world He created. Not only is the heavenly temple full of His glory, but even the whole earth. In Isaiah 66:1, he quotes God saying; “Heaven is My throne and the earth is My footstool.” So many wonders in our natural world are awesome. My breath was taken away when I first viewed the Grand Canyon. God is even greater. Finally, Isaiah states that the sound of their voices shook the doorposts and thresholds and the temple was filled with smoke. These marks of terror reveal an overwhelming experience. Just the sound made the doorway quake. Temblors cause destruction and often fire. But the foundations of the heavenly temple are firm. If the sound of angels can have such an effect, what about the voice of the Almighty? God used a pillar of fire and smoke to guide the Israelites out of their slavery in Egypt, through the wilderness, and finally to the Promised Land. But from his reaction in the next verse, Isaiah was not thinking of that. Next we’ll take a look at Isaiah’s response.